In advance of going to the market ORS believes in answering as many of the uncertainties that affect the bidding process as possible e.g. ground investigations, site surveys etc. in order to minimise conditional bids and so make the marketing process that much simpler and more competitive. A fully comprehensive information pack was provided upon which bids were made. 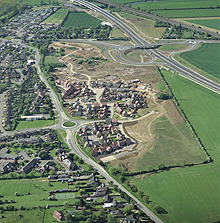 The site was sold to Persimmon Homes for 263 houses by the vendor's Agents, Warmingtons, Chartered Surveyors.